As someone who has a relatively decent collection of original art and limited edition prints, and as someone who has been ‘collecting’ (casually, for certain) for probably three or even four decades by now, I am certainly interested in learning more about what I should or should not be doing. I am clearly the intended target, given the sub-title: Market Insights for Everyone Passionate About Art. I was intrigued by the title but I didn’t really know what this book was going to go in to and so requested this out of curiosity. Mostly I found that this book does not apply to me. This book is not for someone passionate about art but for someone – someone with money to spend – who is passionate about collecting. While there is the adage to collect something that interests you, this book tends to focus a little more on whether or not the pieces that interest you might be worth more money in the future and how to find those pieces. It also deals with tax laws and auction houses. Those are items of interest for the art collector who has the money to burn on valuable collections. I’m that person “passionate about art” who wants to know how to find the appealing, affordable-on-a-lower-middle-class-income and not get ripped off. Tax laws for valuable art collections? That’s way out of my league. In his introduction, Woodham writes “I wrote this book to help open the world of art to more people” but I think the book does the converse. I’m now less interested in getting involved in serious collecting. There’s a world of fantastic art out there and I’ve found web sites where extremely talented ‘new’ artists are posting work for sale and I’ve made some purchases of really fantastic pieces at great prices (in my mind). This sort of art collecting is not addressed in Woodham’s book at all. Why? Perhaps because it’s not a big-money item that will reap a larger reward a few years down line. Yet that’s not what the sub-title or the introduction in the book suggests he’s after. There seems to be some confusion on the focus of the book and ultimately this small-time, little-money art lover is not the intended audience for this book. Looking for a good book? 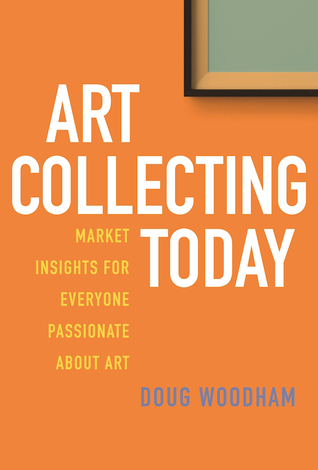 If you have money to spend on big-ticket item art collections, then Art Collecting Today by Doug Woodham is probably a valuable resource. For the rest of us, this is mostly a pipe-dream.